Here is a hotel that keeps its promises. It’s chock-full of stories, and home to one of my favorite bars, anywhere. Built in 1909 on one of the world’s finest natural harbours, the Manila Hotel is the most compelling legacy of the Commonwealth era in the capital. Even though it’s not as well known as many others, the Manila Hotel is as grand is any colonial landmark in the Far East. 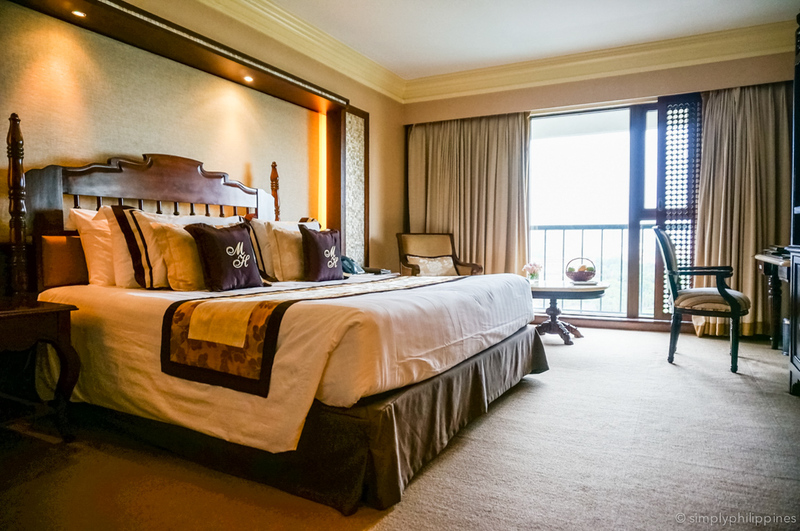 Read on for SimplyPhilippines’ Manila Hotel review. 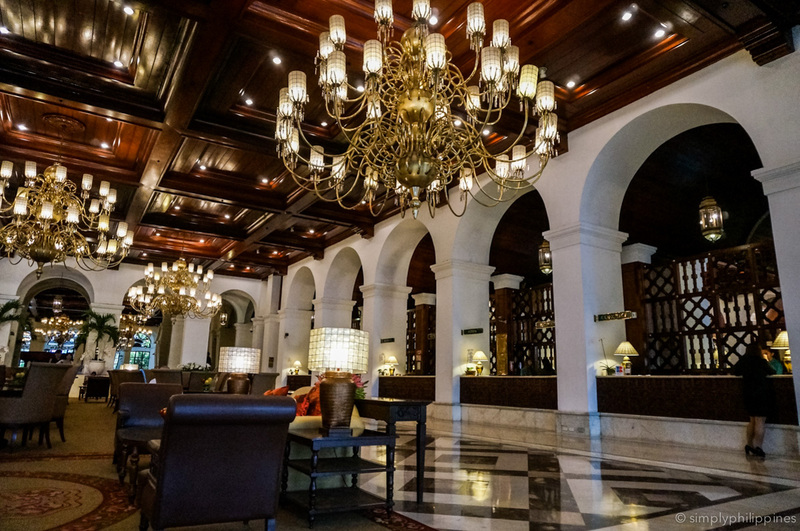 First impressions at The Manila Hotel reveal the hallmarks of colonial-era hotels: potted palms and gloved bellboys, brass chandeliers and arching windows. But on second glance, the details are definitely Filipino: terno dresses worn by staff, lamps inlaid with mother-of-pearl, even the luggage screening at the door says you’re in Manila. The 530-room hotel is a fusion of two wings: an older wing dating to 1909, and a “newer” wing which debuted in 1976. There’s lots to take in. Embedded throughout the hotel are points of interest discerning travelers will appreciate, like the splendid Tiffany window in the Tap Room, Fernando Amorsolo’s painting “The Traders” in the lobby. The hotel’s roster of guests sparkles with names like Ernest Hemingway, Marlon Brando, Gloria Estefan and Neil Armstrong. There’s a story around every corner here, so much so that the hotel has its own historical archive open to guests and outsiders. Be sure to book a tour before you leave. The Manila Hotel is set along Manila Bay at 1 Rizal Park. The hotel is near the airport, but removed from the main business districts of Makati and Fort Bonifacio. Manila’s best historical attractions are all close by. The Manila Hotel renovated all the rooms in its newer wing in 2010. Guestrooms and suites in the old wing are scheduled for a sprucing up. The plush, spacious rooms in the new wing overlook Manila Bay on one side, and old Manila on the other. If you look for them, you’ll find lovely local touches, such as capiz shells, woven into the decor. There’s something ‘in transition’ about the rooms at The Manila Hotel. It’s a straddling of old and new (ornate, carved television chests opposite sparkling marble bathrooms, for example.) Despite this, all the comforts of a modern hotel are here, anchored by the palpable presence of history. Room tip: The rooms in the new tower facing Intramurous and the city actually have a higher interest factor that those looking towards the water. Though quiet about its F&B offerings, the Manila Hotel delivers at a surprisingly high standard. At Café Ilang-Ilang, the hotel’s airy buffet venue, guests feast on first-rate international and breakfast buffets. It’s a lovely spot to dine in, with all kinds of seating to choose from depending on your mood. The staff are attentive, the kitchen has finesse, and the whole operation is thoughtful and impressive. There’s even a slick coffee bar to boot. If you love dim sum, don’t miss Mabuhay Palace, where Chef Sun Bing turns out exquisite, updated Cantonese and Szechuan cuisine amid latticed lanterns, jade murals and scarlet carnations. Get a mouthful of his succulent steamed Hakau, or try the kitchen’s own spinach tofu. Both are delicious. There’s a bit of whimsy in the menu too, shown in creations such as salted egg ice-cream and chocolate-dusted beef bun. The Tap Room is a simple name for the most handsome watering hole in Manila and perhaps the archipelago. You know the type: gleaming wood-panelled ceilings, brass lamps, black-and-white photos on the walls. I highly recommend you go soak up the old-world atmosphere with a well-mixed drink, and stay to hear the live jazz band. The Manila Hotel has great access to the sights in Intramurous, Chinatown, Rizal Park, Corregidor Island and Pasay City. Within the hotel, you have a fully-equipped health centre, a spa, an outdoor swimming pool, a deck for sunset viewing, and importantly, the hotel’s own historical archives. Don’t miss a free tour of The Manila Hotel — it’s full of stories. The MacArthur Lounge on the 15th floor is the hotel’s dedicated business centre. Up here there are superb city views all around, and of course you’ll have access to privileges such as private meeting rooms, all-day refreshments and complimentary tea and cocktails. Need to pick up a gift? The Manila Hotel operates a small boutique just off its glorious lobby. Superb service, dining and location are all advantages, but the real lure of the Manila Hotel is its extraordinary heritage. You cannot be unhappy in these restful spaces, or alone with all the stories that linger.